Hurry up and select one of the best garments jobs for from the garments industry if you’re a graduate from the fashion designing area. Also, that is the right path for you when you the passion into a profitable and rewarding career. For example, designers are maintaining one of the most essential roles for product design in the garments industry. Talent and skills required for launching a new design. Also, some initial creators must be needed like fashion knowledge that ranges all across the industry to become professionally successful. And essentially, you must have a practical knowledge of fabrics, colors and others materials so that you can create prototypes for fashion or trade shows. Their jobs are found in different areas to show their creativity in the garments industry. That’s why if you’re someone who loves to stay updated with the latest garment trends then there are best garments jobs might be the right path for you to explore. Besides, you should have the passion for following fashion trends and being updated with the latest in garments, accessories, and brands are important to make it big. 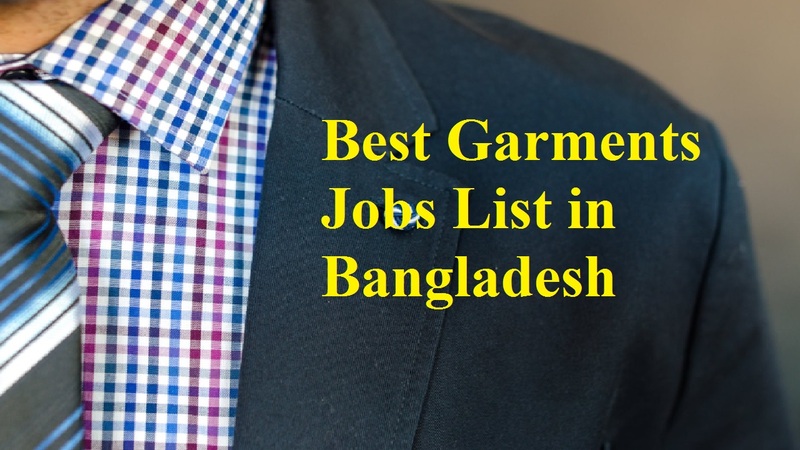 So, here is a spectacular list of the best garments jobs in Bangladesh that are surely going to make you go if you’re looking for career options in the garments industry. There are extremely brilliant fashion designers out, from legendary pioneers to emerging talents. As the fashion designers understand the needs of their clients, they create attractive garments, apparel, and accessories according to the current fashion trends and market conditions. You must possess exceptional creative talent, artistic skills and a flair for designing to be a successful designer. It’s one of the best garments jobs that have opportunities for the fashion designers. Apart from the garments industry, you can also work in export houses, manufacturing units, branded fashion showrooms, boutiques, and studios. As textiles are different types of cloths or woven fabrics, there are used to make clothes, including materials like tie-and-dye fabrics, wool, etc. Also, these are the jobs of textile and Apparel designers that to create patterns and designs for knit, woven and printed fabrics. Moreover, they are also involved in other processes like yarn making, weaving, knitting, dyeing, finishing processes, etc along with this. But, there is a simple difference between Fashion and Textile Designers that you’ll understand when you’ll work there. Accessories can make you look glamorous. Accessories include footwear, scarves, handbags, belts, hats, sunglasses, neckpieces, etc, whether you’re matching a pair of shoes with your outfit or putting together a whole new look for a party. You get to design these using your creativity and keeping in mind the current trends as an accessory designer. Apart from the garments industry, you also can work in the apparel manufacturing industry or create your own brand of accessories. When you’re a famous designer, even you have a chance to work in the film and television industry to design costumes, apparel, and accessories for movies and TV shows. This is the field that needs not only your technical skills but your creative bent of mind as well. It’s the industry that is an especially suitable fields for students those who are from a science background. This is because fashion technologists work on the development of garments, their production, and quality management. If you’re a good Fashion Technologists, you have great chances to work in garment manufacturing units, fashion houses and film and TV production units. As they need to manage top-of-the-line luxurious brands, the Luxury Brand Managers use their marketing and business skills. When you’re in this job, you can be involved in various areas associated with the management of a brand, including conducting market research for products, supervising marketing campaigns and branding, organizing multimedia advertising campaigns, and working with brand ambassadors as a manager of a luxury brand. If you have the associate course then you can work in profiles such as Brand Manager, Fashion Goods Product Manager, Fashion Retail Manager, Fashion Public Relations Specialist, Marketing and Visual Merchandising Manager for luxury brands. If you have a love for fashion and a flair for business and marketing then this is the perfect field for you. You need to conduct in-depth research and analysis of the latest fashion and market trends to predict the success of products among consumers as the managers for fashion businesses and brands. Also, you have to maintain the brand value of the product through media and advertisements, develop innovative marketing strategies, promote products through visual marketing campaigns, etc as a garments business manager. Moreover, you can work to market fashion products globally using social media platforms with the boom of social media’s use in business. The person who decides which styles are finally sold in the store is an assistant buyer. They not only discuss quality but prices through negotiation with the supplier as well. For a high street fashion retailer some common job duties of the assistant buyer are including meeting and greeting clients, chasing production, processing orders, maintaining office stock, collating and sending samples to the press etc. For a Design and Production departments of a fashion/retail company, a Design and Product developer works for. Also, they are responsible for reporting to the Product Development Manager. And it’s their duties to follow Product Developer for initial drawings to final sample, liaising with factories and also travel to offshore factories to follow progress and check production etc. That’s why you should know material specifications and analyze cost when you’re a Product Developers for the garments industry. As part of a technical design team, working closely with the pattern cutter, sample maker or cutter work in the sample room. Before cutting it out with shears, the sample cutter is responsible for laying out the sample length of fabric. You need not only a steady hand and close attention to detail but accuracy to maintain a straight grain and selvage as well. Moreover, they also responsible for arranging the most economical lay plan for each style as a sample maker. As a Garments and Fashion fabric colorists, you’re responsible for mixing, developing, and creating colors and color palettes for clothing, clothing lines, and textiles. Also, it is up to the textile colorist to mix it with precise specifications and the designer or another client will have a specific color in mind.